Holy skimoly! I’ve been so busy all day that I haven’t been online and when I opened Wintersong stats my hits had more than doubled today! You know what everybody’s reading? How to tell a female eggplant from a male eggplant! What in tarnation have I started?!!! Sounds like a lot of eggplants that look like the one on the left (the female) are being left behind in favor of those that look like the one on the right which is of course the male. I learned it from a clerk in a veggie stall in Seattle’s Pike Place Market, tried it out and had success so I’ve bought the little guys ever since. Just to be fair, there are those out there who refute the claim. I leave it to my reader to decide for themselves. For the first time in a very long time, I feel as if I accomplished a lot today. For months I’d planned to paint an old Pottery Barn Console from its tired looking green to a more sophisticated black. The maid we hired for the chemo interim looked askance each week as I told her to leave it and the stacked up garden books alone. She was more or less convinced that I was the worst housekeeper in the west! Won’t she be surprised when she comes in Thursday and sees it all beautifully painted by Moi (!) and all those colorful book jackets lined in a row on its lower shelving. Taking the advice of the building contractor who renovated our bed- and bath rooms, I diluted the water based flat black paint by half and gave it four coats instead of the usual two. For the extra work, I got a very flat black surface without any brushstrokes! On Saturday a man came by our house for a short visit. Robert and I were classmates in 1952-53 at our old country school in Florida and, though I saw him off and on until my parents left the farm and moved from Ellisville in 1958, we reckoned it was at least 50 years since we’d spoken more than a few words. 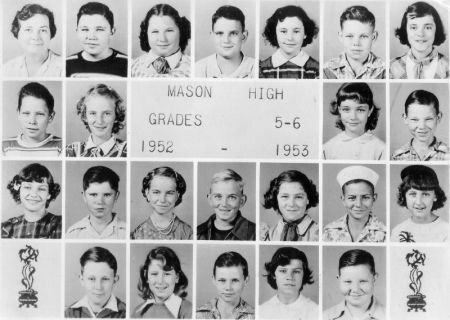 Check out this class photo from that year, last two pictures on the 3rd row down. He’s the boy in the sailor hat on my right. Out of the whole bunch, we were the only two with hats on. When I showed it to him and his wife who was with him, and whom I’d never met, I told them it just showed we were two originals out of the whole bunch. Sure would be fun to know what happened to Mrs. Sapp (nee Miss Granger) and all those others. Look carefully to see if you see yourself there. That’s about all the tidbits I have time for tonight. I just might do some more painting tomorrow. I’m on a roll. (Soon as I have time I going to look for a poem about that and show it to you here. I think it’s so much fun.) Have a great week everybody! I’ll be around. I remember that original post on eggplants. those on sale seem to be like the ones on the right of your photo. Thanks for the tip about diluting the paint. I have a list as long as my arm of painting jobs that need doing. 😦 Maybe I should get started! Just between you, me, and the bedpost, more than doubling my normal hits isn’t all that many–but curious anyhow that about 2/3rd of them were for that one post. I was at first skeptical about the paint tip, so what I did was take a plastic food storage container from my kitchen–so I could throw it away afterwards and not worry about clean-up–and mix equal parts of paint and water. I stirred it with my 2″ paintbrush and restirred frequently. Today I’m painting wooden picture frames and baskets, so I’m glad to have half the quart can left with full strength paint for those and future projects. There’s something about getting started painting! When I finally get started I look around and see what else I can paint (besides my elbows and fingers).